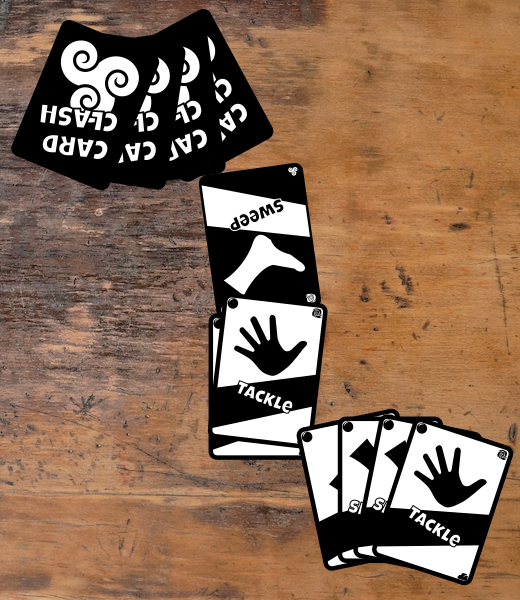 Card Clash is a quick game that sees 2 players attacking and counterattacking with cards whose type preference beats the previously played card. If your opponent can't counter your attack with any of the 4 cards in their hand, you win the round! But each successive round adds a new set of stronger cards into both players' decks, so try to get the first attack in to knock out your opponent before they get a chance to play a devastating attack! The first to win 2 rounds wins the game. The print and play components included on this page include both a full-ink and a low-ink version, as well as optional card backs intended for the full-ink version. Both versions include 2 decks of 40 cards each.